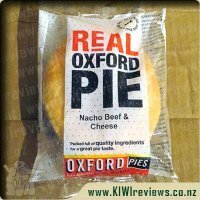 Real men CAN eat quiche... because it is in an Oxford Pies wrapper so it&apos;s real food for a real bloke. And it has meat, lots of meat. Real men CAN eat quiche... and I can even hold my head up and eat mine as I walk in public! So there! Ahhh, stereotypes... How I both love and hate them. But this quiche... this I just loved. 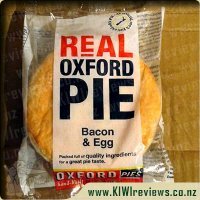 Plenty of meat, good amount of egg, wonderful flavour, pastry that held together but didn&apos;t resist the bite. This is what a good quiche should be like, and I can tell you that I know plenty of bakeries who could learn a lesson or three from this wee morsel. Fitting into my hand nicely, this was a nice snack-size portion for one. It wouldn&apos;t satisfy me as anything more than that though so the price would be more a reflection of the quality rather than the quantity you are getting. I tried this three ways - on it&apos;s own, with tomato sauce and with a spicy BBQ Chilli sauce and I can say without a doubt that it goes very well with either a sweet or a spicy sauce, and was still very appealing &apos;au natural&apos; too. 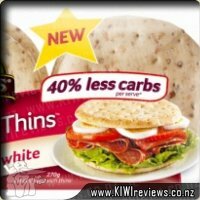 Overall, a great grab &apos;n&apos; go snack, and one I will certainly be keeping my eye out for in my travels. 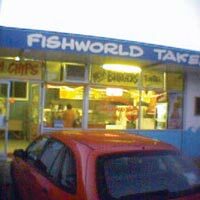 Grabbing a couple of these early in the morning if I am heading up to Auckland - when I want hot food that won&apos;t dribble burning hot liquid cheese down me and can be eaten fairly easily one-handed - will be high on my list of &apos;breakfast options&apos;. I lie to eat a good quiche, I make one at least every fortnight at home but I still like to grab one on the run every now and then. My first thought that this was a good serving size but perhaps could have been a little fatter, other than that it&apos;s a good serving size. Cutting it in half to share with my husband, I did find the pastry on the base a little tough to cut through but after that things moved along fine and it looked like a yummy meal. The main thing I could taste in this was the ham, far more ham than anything else it seemed. This wasn&apos;t too bad a quiche but I would have liked a bit more cheese and egg, hence having a slightly fatter quiche would have been a good thing. A nice quiche for on the run, only a little bit of improvement needed, good for a nice treat on the run. I love quiche but since I am married to a man that doesn&apos;t like eggs (and cooks the meals) I rarely get to have one. 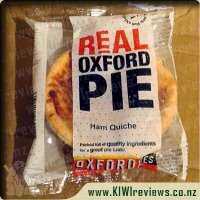 Being able to buy a quality individual ham quiche like Oxford Pies produces is a treat. On the top is a single slice to tomato and that is the only vegetable I saw so if you don&apos;t like tomatoes you can easily remove it. The quiche contained much more meat than I expected which was a lovely surprise. According to the packet it had more bacon (not ham) than eggs. This unfortunately made it a bit salty for me. 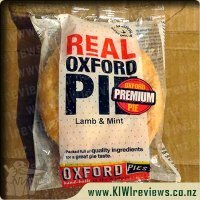 I won&apos;t let that stop me from buying one in the future if my favourite Oxford products are unavailable. The pastry was crisp and held the quiche well. This is definitely a nicer quiche that I would expect from a heat and eat one. Now, I am a big quiche fan, I cannot resist the ones from the bakery across the road, but while this one was nice, there was one issue. I have found that the bacon from the bacon and egg pie was rather salty, and the same goes for the ham in this quiche. There were no other problems with this quiche, but the ham sort off took over the other flavours if you know what I mean. The quiche didn&apos;t look like what I thought it would, it was more like a pie in shape, and if it had a lid then it pretty much would have been a pie. The ham wasn&apos;t terrible, but wasn&apos;t the best either, but the quiche was still very nice, just to make things clear. 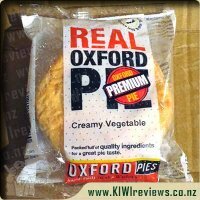 So far I have been gorging on pies to get through the review stock I was given, so it was nice to have something different thrown in as well. The taste was interesting, but the salty ham was pretty much all I could taste, I didn&apos;t get much of the egg or cheese, so I&apos;ll have to give this one a 7/10. The fillings were okay, they were mostly solid, so this thing would be easy to eat in a car; I&apos;ll give this aspect a 9/10 simply because in terms of taste it wasn&apos;t that great, but in terms of solidity it ranks highly. The pastry was good, it had a taste that gave me a serious dose of deja vu because it vaguely reminded me of something else... it was also quite firm and wasn&apos;t flaky, so it is less likely to cause a mess. Overall, I think that this quiche was okay, but not the best, so I&apos;ll have to say that this is something that I recommend less than the other pies. I love a good quiche, and I figured it was the perfect thing to share with my toddler for dinner one night. My idea of a quiche is something that has a lot of egg, and some additions like meat and vegetables. The bottom o it is always a bit soggy and it&apos;s quite a mess if my home-made ones are anything to go by. This one I baked in the oven. It did take a bit longer than the recommended cooking time. But then, I have a gas oven. I do love the crunch of pastry when something has been baked in the oven too. Not as soft and soggy as a microwaved pie. The first thing I noticed with this, as I cut it up to share was that the bottom was nice and crunchy. I love that the bottom of this quiche was not soggy! 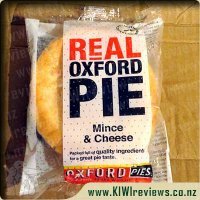 Bonus points to Oxford pies on that one. The pastry remained dry and crunchy, despite the liquid level inside the pie shell. You can hardly tell what the pastry flavour is like, because the filling of the quiche is so full of flavour. 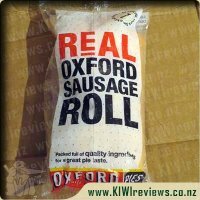 My toddler wasn&apos;t as sold on this as she was the sausage roll though, probably because of the flavour. Inside is tomato, onion and pepper with egg and bacon. You could tell there was tomato in there, because there was one or two thinly sliced pieces in the mixture. The bacon is cut in good size pieces. Around the size of a 10 cent piece. This was really filling! 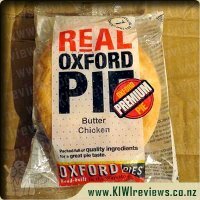 You don&apos;t normally expect to find a great tasting quiche in a wrapper in the local pie warmer, but this is what you get with an Oxford ham quiche. 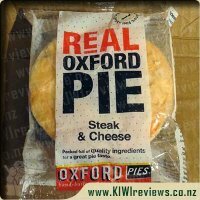 A great tasting alternative to a traditional pie that is manly enough for any man out there. I heated this up in the oven and got a perfect pastry, just the right amount of crunch to it without being dry and too crusty, it also wasn&apos;t soggy in any part. After the first bite it soon become apparent that this tasted just like a home made quiche. 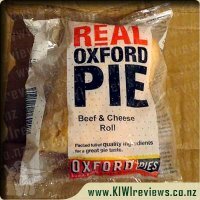 The filling was really good, it had a lot of meat in it, tomato on top and was just right in all regards, I was really happy with how it all tasted and maybe be slightly swayed to eating this then say a normal pie now. 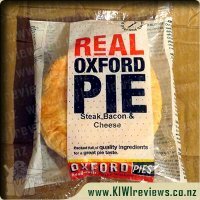 So for taste, and great fillings I suggest you try one of these Oxford ham quiche&apos;s as I don&apos;t think you will be disappointed, sure it&apos;s probably not the manliest thing to eat out there, but we are in a new age world, buck the trends and try one of these. Sometimes things can get a little twisted around here! Enjoy. 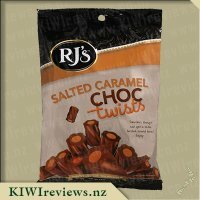 Salted Caramel choc-filled centre, wrapped by a soft Caramel twisted licorice. 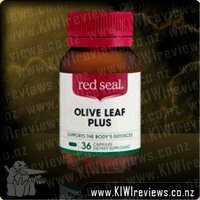 Contains gluten from wheat, soy, dairy and liquorice extract.